Brazil in 2014: Will Rousseff change course? Editor’s note: Paulo Sotero is director of the Wilson Center Brazil Institute. The views expressed are his own. This is the latest in the '14 in 2014' series, looking at what the year ahead holds for key countries. Three consecutive years of disappointing economic performance, with an average GDP growth of barely 2 percent and deteriorating fiscal and external accounts, should be enough to convince President Dilma Rousseff to move Brazil away from the inward policies and micromanaging style she introduced after succeeding her popular mentor, Luiz Inácio Lula da Silva, in January 2011. The same mindset has affected Brazil’s international affairs, with similar results. A leader with little appetite or patience for diplomacy and focused by necessity on domestic challenges, Rousseff implemented a modest foreign policy agenda when compared to her predecessor and became the first Brazilian president to fire a foreign minister, over a preventable incident. 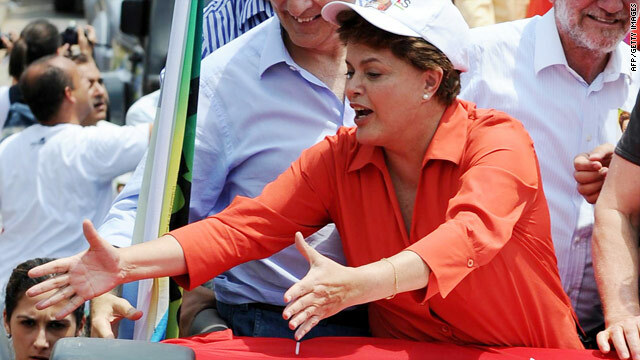 There are both negative and positive incentives for Rousseff to change course as she faces reelection in October 2014. The consensus among market and political risk analysts is that the Brazilian economy, the world’s seventh largest, will get worse before it gets better. An expected lowering of Brazil’s sovereign debt risk rating to just above the investment grade arduously obtained in 2008 will make capital more expensive for Brazilian companies. This is likely to happen at a time when the Central Bank will be dealing with the adverse consequences of the end of the U.S. Federal Reserve policy of monetary easing, which Rousseff once compared to a “monetary tsunami.” Her finance minister, Guido Mantega, criticized it as a weapon in a “currency war” that made the Brazilian real overvalued and uncompetitive. The problem now is the reverse, as the real loses value against the dollar and adds pressures to an economy tormented by an inflation of 5.8 percent that is kept below the 6.5 percent upper limit of the Central Bank target thanks mostly to government containment of prices under its control, such as gasoline and diesel. Signs are that, in a deteriorating environment, Rousseff could have problems raising enough campaign contributions for herself and her multiparty coalition from a clearly unhappy business community. The president knows that rising and uncompetitive prices in a slowing economy could frustrate her reelection plan. With interest rates back to double digits, from 7.25 percent at the end of 2012, a fiscal adjustment is in order, but unlikely to be embraced in a campaign year. Waiting, however, will only make the problem bigger. On the positive side, after many false starts, the government program to attract domestic and foreign investments to expand the country’s infrastructure took off at year’s end with successful auctions of some major projects, including the Rio international airport, the Libra pre-salt oil field and a few roads, with more to come. Approaching $400 billion, currency reserves, on the other hand, lessen the risk of a crisis. Polls suggest that most Brazilians are dismissive of the clouds economists see forming in the horizon. The reason is that, despite the souring of the macroeconomic picture, what people see is their income going up, unemployment at a record low and credit available for consumer goods and housing. No wonder Brazilians seem well disposed to reelect the president. That is what almost half of likely voters told pollsters in October and November. Rousseff’s popularity may have been helped by a decision she announced in September to cancel a state visit to the White House after revelations of the Snowden files that American intelligence had allegedly snooped on her, on Brazil’s oil company Petrobras and on email accounts of millions of Brazilians. Making clear she is not a leader to be fooled around with, Rousseff announced a decision to buy 35 Grippen jet fighters from Sweden for the Brazilian Air Force, a deal worth $4.5 billion, over Boeing’s F-18’s that she had come to favor until the Snowden disclosures. But Rousseff also used the Snowden revelations to show she can act with restraint. In December, she rejected calls to grant Snowden asylum. Around the same time, a resolution to protect privacy on the internet that was initiated by Brazil and supported by Germany and other European allies of the United States was unanimously adopted by the U.N. General Assembly just as a panel of experts convened by President Obama proposed limits to NSA spying activities. In May, Rousseff will lead a global conference on internet governance in Brasilia. On the home front, Rousseff will greet the New Year in good shape, despite the growing doubts over the economy. Politically, she has recovered from the steep loss of popularity experienced after last June’s massive street protests. The good news comes, however, with one important caveat. Disconcertingly, two thirds of the voters – a larger proportion than of those who say they would vote to reelect her – have said repeatedly in polls that they want change. What that means exactly is left for Dilma, as she is known, and her challengers to figure out. The popular revolt that shook the country and paralyzed hundreds of Brazilian cities for days earlier this year took the government and the opposition by complete surprise. It was mobilized by social media, with no participation of political parties or unions. Provoked by excessive use of police force against students asking for free fares on the poor public transportation system of São Paulo, the country’s largest metropolis, the protests turned quickly into a very loud cry for more and better services that affect the quality of life of millions of members of a new middle class, whose emergence in the past decade has transformed Brazil’s social landscape and created new demands. The revolt had important consequences. Members of Congress, denounced at the rallies as self-serving politicians oblivious to what matters to the people, hurried to regain some popular trust. Under pressure from the streets, they rejected a proposal to limit federal prosecutors’ investigative powers against corrupt politicians and officials. They also banned secret voting by congressmen in decisions involving ethics cases. Mindful of the people’s bad mood, the eleven members of Brazil’s Supreme Court also went into action. On November 15, the country’s Republic Day, they unexpectedly ordered more than a dozen politicians, businessmen and associates to start immediately serving the prison terms to which they had been sentenced in 2012, in the largest trial of political corruption in Brazil’s history. It was an unprecedented and welcome move in a country with a long tradition of impunity of criminals in high places. Among those sent to jail were former senior members of the Lula administration and of his Workers’ Party. Seen as a hardworking and honest leader, Rousseff did not interfere and was left unscathed by the episode. So, the streets have quieted down, but maybe not for long. Former Senator Marina Silva, a founding member of the Workers’ Party and a minister of the environment under Lula, has predicted that the protests will return in 2014. Marina, as she is known, received an impressive 20 million votes when she ran for president against Rousseff in 2010. She has shifted her support to Eduardo Campos, the popular governor of the state of Pernambuco, and could emerge as his running mate. Polls suggest that, in that scenario, she could complicate both Rousseff’s campaign and that of the president’s current top rival, senator Aécio Neves, a center-right former governor of the state of Minas Gerais. If Marina’s prediction about protests is correct, the most likely timing for it to happen is from mid-June to mid-July, when Brazil will welcome the FIFA World Cup, just ahead of the presidential race. What happens in and around the soccer fields in the twelve state capitals hosting the games may be less relevant for the elections than what happens until then in terms of inflation, jobs, investment and growth. With that in mind, and considering the difficult challenges Brazil is bound to face in 2015, some joke that Rousseff’s problem is not to lose next year’s presidential election, but rather to win. « Previous entryCan world prevent more Lampedusas? If you are the captain of a cruise ship and there is not a single Barry White Record on board, then you just...you...no. The pilot episode of the new "Love Boat" series is writing itself. Shift all resources from the next Austin Powers movie. Oh, I sincerely hope there isn't a new "Love Boat" without a new "Fantasy Island". That would just be...wrong. There is an opportunity for peace here. Israel should be more willing to lock horns with Hollywood as they manipulate every single ending scenario known to man to become rich and powerful. I would like to officially add this addendum in the next Israeli/Palestinian accord. Once a month, Israel should be able to put Spielberg or similar in the hot seat for questioning, oh and televise it! lol This would be entertainment for all and would actually create peace. We will call it the council of cry-seya. No doubt Rousseff's continuity with the Lula government, under which millions of Brazilians saw their standard of living rise, will secure her re-elections. She is known to favour a strong state role in strategic areas, including banking, the oil industry and energy, which is not always a good idea, as it has shown. She hasn't been able to deal with corruption, and is criticised for inadequate public services and the expense of staging the 2014 football World Cup. Should she be re-elected, her second term would be haunted by problems, that she previously not tackled. INYECCIONES CON NANO TECNOLOGÍA CASO FRANKLIN BRITO. CHAVEZ Y MINISTROS VENEZOLANOS EN EL CASO DE EXPROPIACIÓN DE LA HACIENDA LO LLEVARON A MÉDICOS MILITARES Y LE INYECTARON MEDICAMENTOS CON TECNOLOGÍAS INVASIVAS. DERRETIR VICTIMAS PARA ROBARLOS Y QUE NO QUEDE EVIDENCIA..
DEVELADO PLAN NAZI PARA PROGRAMACIÓN HUAMANA VENEZUELA. AGENTES ESPAÑOLES RUSOS INGLESES QUE VIAJAN PARA ACTIVIDADES DIFERENTES. SON APRESADOS POLÍTICAMENTE EN TIERRA, DESDE SATÉLITES DE OTROS PAÍSES, EN DIFERENTES ORBITAS. LES TRANSMITEN CON CÓDIGOS ALFANUMÉRICOS Y LES ARRANCAN RAMAS NERVIOS Y GRUPOS CELULARES. CUANDO PIENSAS SEGÚN TESTIGOS LOS CAUTERIZAN EN CÉLULAS ESPECIFICAS DÍA Y NOCHE. ARRANCÁNDOLES LAS ZONAS QUE GENERAN LA ACTIVIDAD. BANCOS NORTE AMERICANO LLAMANDO A RELACIONES POR ORDEN DE OBAMA OBJETIVO BANCO PERFECTIBLE. ESTA DENUNCIA SOLO ES CALCULO. PRESIDENT VICE PRESIDENT AND MANAGERS, CONTRACTING INTELLIGENCE AGENCIES TEAMS IN PSYCHOTRONIC SATELLITAL ACTIVITIES FOR BANK ROBBERY. MOBILE CRIME BANK PERFECTIBLE MODEL VENEZUELA JUAN CARLOS VALLEJOS. SEND TO FBI INTERPOL EUROPOL. DENUNCIALOS A CAPRILES RADONSKI – DENOUNCE THEM TO CAPRILES RADONSKI. LATIN AMERICA BUY YOUR SATELLITE AND MANIPULATE HUMAN. INCREASE THE NEURONAL VOLTAGE TO STOPPING THE SINAPSIS. And what living expenses...take Sao Paulo,where the middle class still struggles and the poor class doesn't decrease...and the wealthy class keeps getting wealthier. A cup of coffee $3.00..and pizza $25 to $30 ?? How can the average Brazilian afford this ?? The raw materials to not expensive, its the taxes that are piled up on top of everything...and the list goes on. As for Dilma...her party consistantly campaigns on deceit...yes we will finance for you...but you better pay our interest rates, yes we will give you a job..but you better pay our high taxes, oh yes and don't forget to pay gas prices..and Ethanol prices(made in Brazil) higher then the USA or most of South America...Corruption is a cultural difficulty that has haunted Brazil since its independence..however it is refreshing to see the supreme court less tolerant with corrupt politicians..maybe the president of Brazil's supreme court, Joachim Barbosa, wouldn't be such a bad presidential candidate.